Inarajan is broken down in different sections Therese explains. Malojloj is a large portion of Inarajan. People ask, 'Is Malojloj a separate village?' Well, no, its getting sort of that way, but it started off as a very small farming community. And then a lot of people decided they wanted to build houses, and raise their families up there. So we have a lot of families living up there, setting up their foundation and just growing. And so Malojloj in itself is a growing, big part of Inarajan." I think of Inarajan as the entire district, says Bill. For me, it really bothers me when somebody says that Malojloj is a village. I remember I was invited to represent the mayor of the municipality and somebody stood up and said, 'This is the village of Malojloj' and I stood up and I made that correction. This is not a village. It is part of the municipality just like the area that Im staying at right now, which is called Belen." Areas within the village of Inarajan. 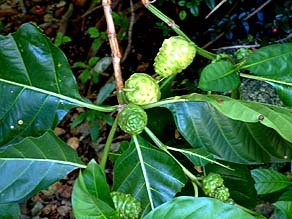 Lada, known by the Hawaiian name Noni. Bear Rock is a natural formation of the rock, the wear and tear of the rock. Somebody said there was a story of a bear, but I think it was just a made-up story, I dont think it is a legend. Because its not part of our legend, its just a formation of a rock, a natural formation that happens through nature as the years and the wear and so on. 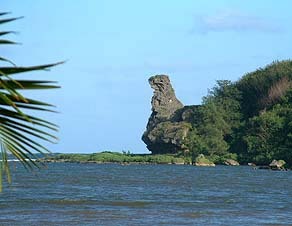 Bear Rock. Old time residents know of it as "Lasso' Gi'ai," a name referring to male genitalia. 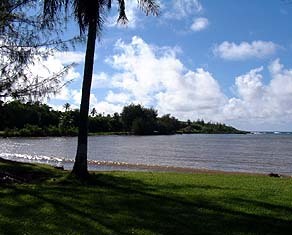 The point of Guaifon reaches out from Inarajan Bay. "Gueha is a word in Chamorro where you take something and fan yourself, Bill explains. "And Guaifon is a beach area. My father owned a property there called Guaifon. I remember the sandy area there where we were, and it was always a very cool area. By 7:00 pm in that area, you need something to cover yourself. I imagine that was the reason why it was given that name Guaifon. "In my area, which is going up to the middle school, its called Sese, and when you really look at it, Sese is 'knife,' and the way the property of this is, theres an area there where theres a stream. In summer it gives that figure of a knife and thats why its called Sese. And so that area is called Sese. We will explore many more areas of Inarajan municipality later, when Rufo Lujan gives us a tour down the coast and orients us to different Areas in The Land chapter. But first, we need to get there.